Make flowers and leaves the star of your quilt. These motifs can highlight beautiful appliqué or add dimension to basic blocks. 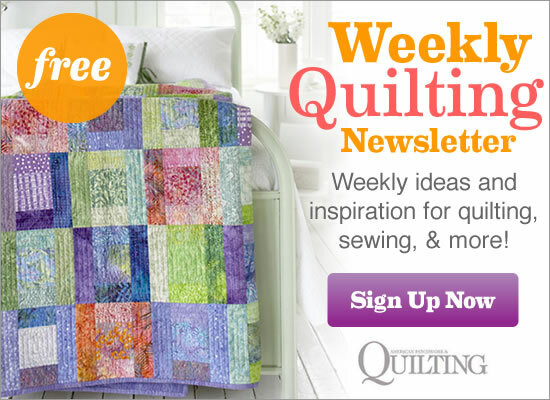 Browse our gallery of flowers and leaves quilting designs for ideas and tips from our machine-quilters. Designer Pat Sloan machine-quilted a free-form flower in each block, then straight-line quilted some of the outer border stripes. See the whole quilt here. A floral-and-leaf motif was machine-quilted in each vertical row of the quilt top. In each block, Sandy Pluff machine-quilted leaves in the medium and dark batik pieces. Ebony Love machine-quilted large flowers and bubbles to echo motifs in the fabrics. Designer Laurie Simpson hand-quilted flowers in the center of the blocks. Laurel Keith machine-quilted a flower-and-vine motif across the intersections of the appliqued blocks. Jo Kramer quilted floral medallions in the blocks.